It was an awesome workshop by Noah Layne and the model was excellent. Noah is an excellent teacher and is very patient and supportive. If you get the chance to take a workshop with him, you will not be dissapointed :) We only had two days so the first day we drew with our brushes and a bit of burnt umber oil paint, gasp, no pencils...no charcoal... gasp!!! Actually it was surprisingly really fun! I will definitely be doing more sketches this way. Usually I would draw out a rough sketch with charcoal as a safety net. But by drawing with paint, you are not boxed into a drawing that may not be as accurate as you like. This way lines and shapes are easily changed as you go along, all the while becoming more familiar with the subject. 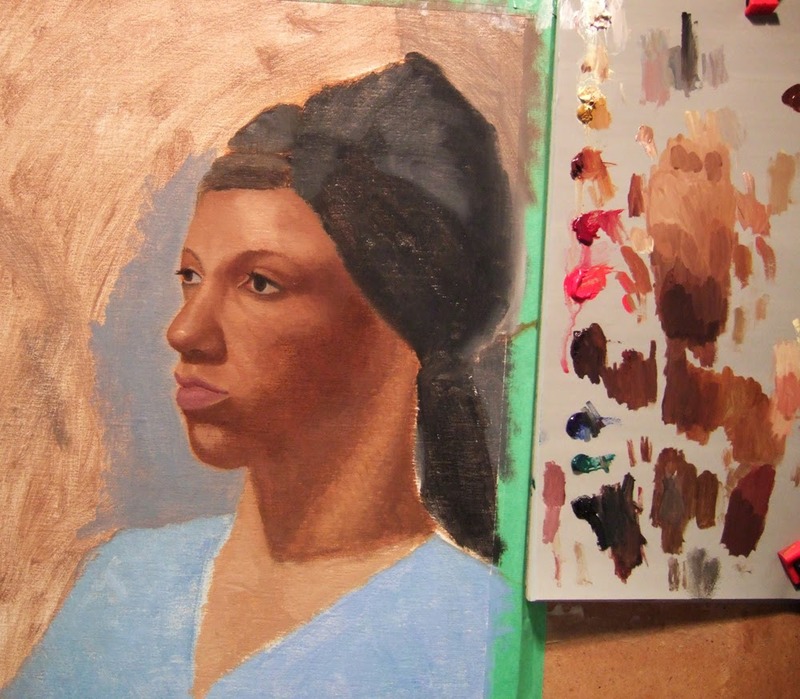 Day one was spent blocking in the proportions with the burnt umber paint. Once I was relatively happy with the proportions I began blocking in her features. One the first pass, I focused more on the values of her skin and tried to think of the facial planes, keeping things relatively 2 dimensional. On the day two, I tried to get closer to her actual skin tones and focused more on modeling the forms. Of course, it was very rushed so I did not get to the lower portion of her face and I would have liked to soften her eyes and model the forms more. It was an excellent learning experience though and I can not wait to paint again from life!